Today I have the honor of hosting a challenge at SCS for this year's Hope you Can Cling To challenges. My challenge is all about using inspiring words. What is your mantra? What keeps you going? 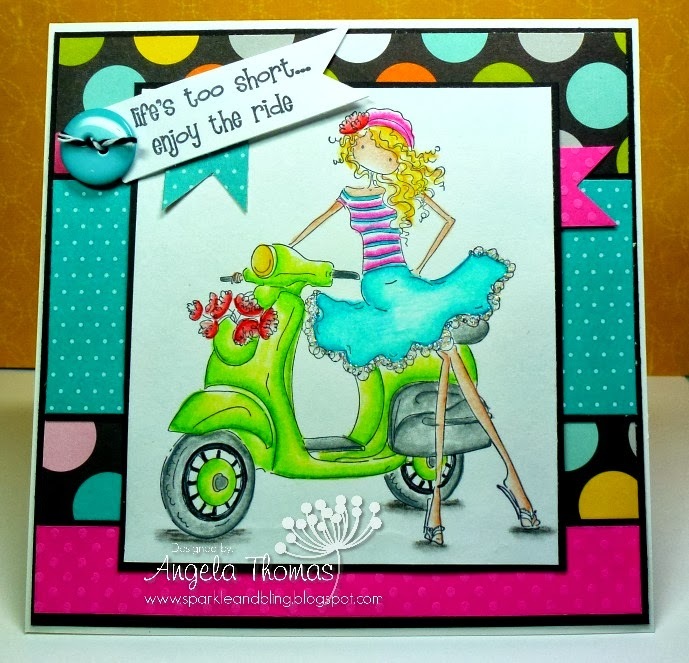 For my card, I have used the Stamping Bella set called "Vienna on her Vespa". The image has been stamped with Archival Black ink and then colored with Prismacolor pencils and Gamsol. I love how bright and fun my card turned out. The layout for my card is a recent Deconstructed sketch challenge. I'll be using it again for sure. I love the sentiment I've used on my card, it really makes you think about how precious life can be. Get out there and enjoy it!! You never know how long it's going to last. We are never guaranteed tomorrow so make the most of your life today. There are so many fabulous challenges planned at SCS for HYCCT so make sure you check out the forum to see them. So many wonderful companies are sponsoring prizes too!!! Stamping Bella is one of them!! We are lucky to have them all on board for this year! !